If you often need to use a set of records in reports, filters or Marketing lists, you can create a segment and use it instead of redefining the same conditions time and again. In other words, a Segment record is a set of Activity and/or Data audit and/or Field Condition and/or Condition Group filters predefined for records of a specific entity, and updated dynamically or upon a direct user’s request. The way to create and manage Segment records is described below. 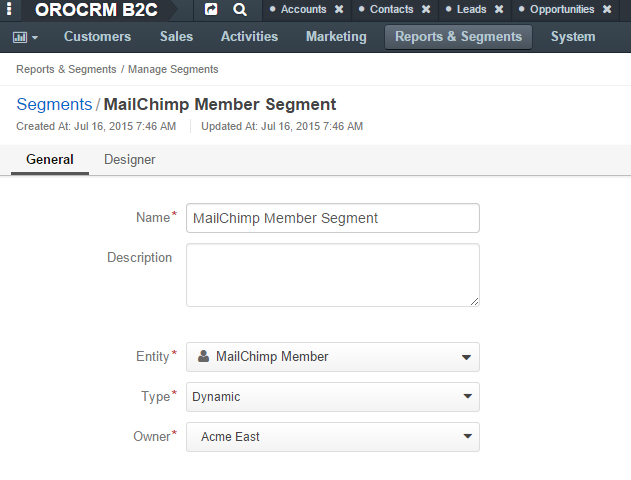 Go to “Reports & Segments → Manage Segments and click the Create Segment button in the upper-right corner of the grid. The Create Segment page will emerge. Entity Choose an entity from the drop-down. Records of the chosen entity will be selected in the segment. Owner A business unit, members of which can manage the segment, subject to the roles defined in the system. Optional field Description can be filled with free text to help you and other users to understand the purpose or peculiarities of the segment in the future. In the Filters section you can define the Activity and/or Data audit and/or Field Condition and/or Condition Group filters that will be used to select the records for the segment. In the Columns section, define the set of fields. The only goal of this set of fields is to visualise records included in the record. Values of the chosen fields will be displayed on the view page of the Segment. Choose a label that will be used to refer to the field in the report on the interface. By default, the field label will be added but can be changed. Define the sorting order if you want the whole segment View grid to be sorted by the field value. Save the segment in the system with the button in the top right corner of the page. The view page contains the grid of records, included in the segment and represented with the columns defined for the segment, as described above.